John O’Loughlin is practice leader in Technology, Operations, Sales/Marketing/Product Management, and Human Resources. Client base includes a broad spectrum of business sectors. His ability to strategically partner with clients in all dimensions of talent management distinguish him as well as his subject matter expertise in evaluation and assessment of executive leaders and their capabilities and potential. O’Loughlin has assisted clients with not only search, but also executive on-boarding, senior level compensation, executive development, and organizational effectiveness. His extensive board and compensation experience allows him to provide client insight and perspective on what style of leadership succeeds in respective environments. Highly knowledgeable in validated executive assessment tools, John can provide selection committees with quantifiable data regarding candidates’ leadership style, critical thinking ability, skill to work with others, and results orientation. O’Loughlin is extensively trained and accomplished in strategic, targeted, and behavioral interviewing. John has achieved a 100% repeat engagement rate with his clients which speaks volumes to his value-add consulting prowess and the quality of the placements. During his earlier corporate career, O’Loughlin spent 12 years supporting the growth of Corporate Express(now part of Staples) as the revenue went from 400 million to 8 Billion. His work as the CHRO was widely recognized as he implemented cutting edge programs that drove up quality of hire, substantially increased employee engagement, and facilitated executive development. Awards for CE during that interim included achieving status as a Best Place to Work and special recognition for its sales force excellence. Education includes a BBA from Texas Tech University and MBA from the University of North Texas. 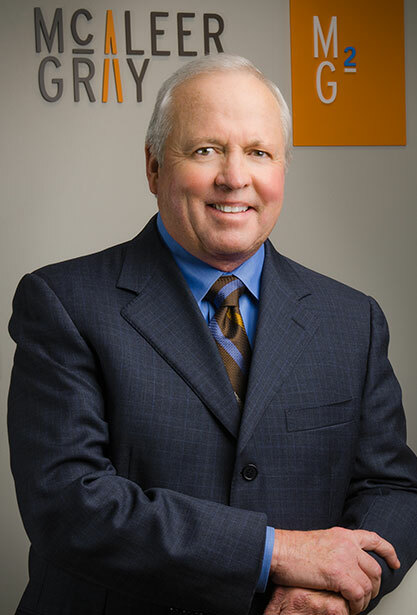 In addition to his McAleer Gray experience, John has served on multiple boards, is a general partner in a farm and oil & gas partnership, and is Founder & CEO of HR Capital Partners, LLC.